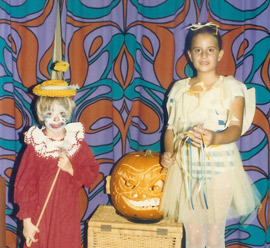 Many children dress in costumes on Halloween. Photo Courtesy of Pat Steinhoff. Halloween is celebrated on the night of October 31 in much of the Western world. It began as an ancient festival of the dead celebrated by the Celts, and almost all modern Halloween traditions can be traced back to this celebration. A favorite Halloween activity of American children is trick or treating. Children put on costumes and go door-to-door, yelling “Trick or Treat!” In return, they receive gifts, usually candy. Traditionally, costumes would often take the form of witches, ghosts, vampires, and skeletons. The ancient belief behind this tradition was that wearing such costumes would trick the evil spirits who came out that evening, determined to commit evil deeds, and protect the costume wearer from harm. Giving gifts to the ghoulish visitors of the night would also keep them from causing harm. Nowadays, children often wear mass-produced costumes of characters from movies or television. Adult costume parties also have become a popular tradition.The jack o’ lantern is one of the most distinctive Halloween symbols and traditions. People will carve a scary or comical face into a pumpkin and place a candle or light inside it, making a simple lantern.